Jesus freak Hideout (John DiBiase): What inspired you to do a project like The Blood? Kevin Max: What's inspired me is that I feel the root of gospel music is the art form that has spawned everything from rock n' roll to what we call CCM today. It was the root of everything. The Blood is literally a coverage record, but it's songs that a lot of people haven't heard before. I mean, I'm going deep into the Delta. I'm trying to get songs that kind of pave the way. I'm doing stuff from Blind Willie Johnson to Kings of Harmony and all of the older stuff. But we're gonna cover a little bit of the golden age of gospel. We're doing a Thomas Dorsey song and I'm doing a couple of modern ideas. One is from Prince, one is from Stevie Wonder. All I have to say is that I'm doing this with kid gloves. I come at this from a very sensitive standpoint because I'm a white guy from Grand Rapids, Michigan, covering the African American culture that's influenced all of music. So it's very difficult for me to say how as a white guy… how I feel I can pull that off. But I don't look at myself as white. I don't look at the issues of white and black. I look at music. Music obviously transcends all of our weirdness when it comes to racism. In a bigger picture, I'd love to see this be a thing that crosses genres. It stinks that we're compartmentalized. Hip-hop has its culture, rock has its culture, and country has its culture. Rarely do you see a group that crosses those. What I do appreciate is hip-hop doing right now is getting into rock n' roll and rock n' roll is getting into hip-hop. With dc Talk, we did that kind of flawlessly because we were a group of three different guys from three different places. It was easy for us to do that. It's good to see some bands that are really trying to make that happen. JFH (John): So after doing a project like The Imposter, you started working on new stuff. What made you decide that you were going to do a gospel record? Kevin Max: Gospel music, to me, is larger than its own genre or its own cliché. To me, it embodies so many different things. The Blood, to me, is bigger than gospel music. The Blood, to me, is about the story of the redemptive blood of Christ which basically washes everything clean. We're all dirty. The thing I love about the blues is that those guys were saying "I screwed up," or "I'm cheating on my wife," or "I murdered somebody," or "I'm drinking myself to death, but God willing, He'll change me." And that's the power of the Blood, and the power of gospel music. Nothing we can do can offend God. I think about this kid at Virginia Tech and I was thinking we can get to a place where we're in our own personal Hell. And Hell is the absence of God. When you take God out of the equation, when you don't want him in the equation at all for whatever reason, there is little or no hope for you. And I think that whether he made that as a conscious decision or not, he was in that place. And it's sad to see that. My heart goes out to him as well as the victims. I think to myself how dark and dismal it must be in that place in that empty room with yourself as the monster. I think that gospel music and The Blood touches on that a little bit too. Without God in your life, it's a slippery slope and it's going to be going downhill pretty quick. Hopefully it will connect to people in that place. JFH (John): When you think of the project and what's really influencing you, what are some of the main artists that have influenced The Blood? Kevin Max: I think anybody that's willing to talk about the nasty stuff, but knows that there is redemption around the corner. Prince comes to mind. Because you know, he's got a nasty mind but I think Prince also understands the need for God. Whatever the hip, trendy religion is at the moment, whether it's Kabala or whatever, it still involves God. People are still wanting God. Maybe in a mysterious shroud they want God; maybe they want God very intellectually; maybe they want God very personally. It's kind of like they all want God. When I look at Prince, I think he's a perfect example of a guy that knows there's a God and wants Him and needs Him because without Him he's just nasty, dirty, funky Prince. And that's cool, but it's not as cool as the Prince that calls out to God. That makes it more interesting. But anyways, even getting into older stuff like Kings of Harmony and Blind Willie Johnson and all of that, I just kind of heard this constant thing going like "I can't do this without You. I think I can, but I can't." I think that's the underlying feeling of it all. It's pretty dark. In fact, it's not going to sound really happy either. It's a record that I think that the person that's on the downhill slide, or maybe on the fence, can relate to. JFH (John): Who are you working with musically? Kevin Max: Musically on the record, we've just started putting some of the players together. I picked John Mark Painter to kind of be my go-to guy right now as far as production and arranging goes. John and I have worked together since right at the beginning of college. He's been a musical comrade of mine since the beginning. I've hired Dave Perkins. He used to play for Bob Dylan. He's played for everybody. He's actually playing with me tonight for the opening. One of the songs we're gonna do for the record is "Run On For a Long Time" which Blind Willie made famous, Elvis made it famous, and just recently, Johnny Cash made it famous. We're gonna get Dave Perkins involved because he's a blues guy. He's really studied the music of the Delta and understands it and knows where it's from. He has his doctrine degree in Theology from Vanderbilt University so I'm dealing with a guy that's very sensitive at the same time. And then I'm talking to Jackie Street about playing bass. I'm talking to a couple of guys about playing drums. I'm thinking about Aaron Smith. He used to play for the 77's and Charlie Peacock. I'm just trying to get a great band together. We're talking to Mavis Staples about maybe being a part of it. I've been talking to George Pendergast about being a part of it. But I'm getting people like that who really make sense. I've got tons of friends. When I think about the Stevie Wonder song, there would be nobody better to do a duet with me except for Jon Gibson. I just want to pick the right people to be involved in this. JFH (John): If you had no limitations, who would you wish to work with on something like this? JFH (John): Have you started thinking about what you might do after The Blood? 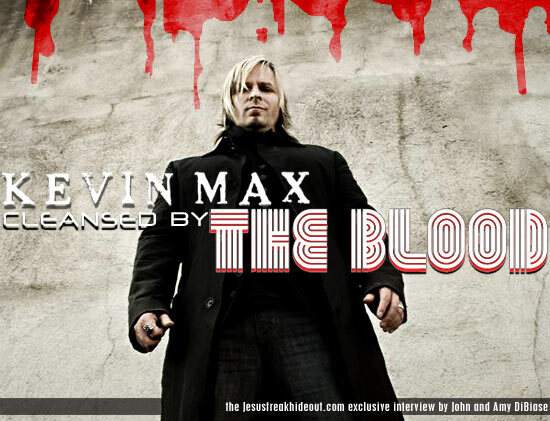 Kevin Max: After The Blood… I'm actually doing this right now but I haven't talked about it because it's not the focus of what I'm doing, but I'm actually starting the next pop record. I just started writing with some of the guys here in town. I don't want to let the cat out of the bag, but at the same time it kind of makes sense in a way. But the pop record is gonna go a lot more electronic because this record (The Blood) is going to be so organic that I kind of want to jump right out of that into something completely different. I kind of chose electro and mixing electro and funk and rock n' roll. I'm just trying to come up with something that inspires me to create something completely different. I've been listening to a lot of electro stuff. There are a lot of great groups out there that people really haven't heard of yet. Some of the groups that are making it big like Block Party and Under the Influence that are kind of taking that disco style and are putting it into pop music. It's really cool. JFH (John): Are you working on Soupernatural (the movie) again? Kevin Max: No, I'm not doing anything with it right now. I've already filmed some of it. I guess they're waiting to drop the bomb so that they can get all of the money out of it that they want. The production end of it has been green-lighted. I think what they want to do is start filming towards the end of the year because they want to raise another $500,000. It's like, "how much more do you want for this film?" I understand that it takes a lot of money to make a film. Even something like Grindhouse that probably had a low budget looked amazing. It took maybe $10 million or maybe $15 million to make that? Kevin Max: Exactly, you've got to go after the names. In Soupernatural's situation, it got a few big names on it. But what's funny to me is that they started out with this bendy mentality. We've got all of these old TV actors and actresses but now they want to go after a box office name. And I'm like…"Why?" It's an independent film; they don't need a box office name. How many great films are made without box office names? There's a lot of good stuff. In fact, one of my favorite films from last year was Pan's Labyrinth. We didn't know anybody in that movie and it was all fine. JFH (John): Are you working on any new poetry writing? Kevin Max: Yes. I'm writing one right now. I'm writing but people hate poetry now. Nobody really respects poetry anymore. I was going to bring my poetry book here today and just give them away but nobody really cares about poetry. Kevin Max: So you're one of the few people that I write the books for. JFH (Amy DiBiase): I got to listen my entire life to my father who likes poetry. I've been very disciplined to understand and appreciate poetry. Kevin Max: That's the reason that I continue to write. It's for that small group of people that really get it. I've found that it's taken me more money to create it as far as packaging it and putting it out there than what I make back for it. At the end of the day, it's costing me more money to put a book together than it is to film a movie. If I sold it to a big publishing company that would be one thing, but nobody really wants to buy poetry. They're like "Hey, okay. You've got poetry. Do you have photography with it? Do you have any short stories to make it a kids book?" I mean, these publishers just don't get it. JFH (Amy): And yet something that you put out next year can carry through generations. Kevin Max: Right. Well I feel that I'm in an okay culture right now. I'm good but I'm not one of the greats. What I'm trying to say is that I don't have any egotistical agenda for not continuing to push it. For me it just doesn't sell well. But I love it. I have to exercise writing every day to get better, but I love it. For me, my favorite thing is to get on the computer and just write a poem as soon as I sit down at the computer. I just write one about whatever I'm thinking. I don't go back over it. I just put it out there. I've been doing that a lot on MySpace. I'll go up and I'm bored and I don't want to read all of the comments and I'll just write a poem. For some reason, it's like there's a crowd out there. MySpace might be a great place to kind of push poetry. I thought about that. Virb.com has more of a push towards photography. Have you ever heard of Urbis.com? Urbis is like a creative writing/poetry outlet type place. So I think it could happen. JFH (John): I have one last question and I feel bad asking it but because of our audience, we get this question a lot. Do you ever see yourself working again with TobyMac and Michael Tait as dcTalk? Kevin Max: Do I see myself working with them? Absolutely. It's kind of like this... I think the interesting part of dcTalk is the fact that there are three different guys. That's what makes it cool. At the same time, that's what makes it difficult. Let's face the facts. It's a little bit of a jolt in this industry now that TobyMac is everywhere now. I'm making music on a different thing. But people constantly compare me to him. And I go "You know what, he's got this pop/hip-hop hybrid thing and my music is completely different." I'm sure Michael Tait is like… "Where do I fit into that?" I'm happy with what I do. If dcTalk decides to do a thing purely financially, I'm into it because that provides for my family. JFH (John): Is there a part of you that wants to do something with them again or are you really content doing your own thing? Kevin Max: I'm curious about it. I'm curious to see what would happen today because I think that the three of us are much better writers and I think that if we were to get together and create something, it would be really interesting. I'm not interested in the social dynamic of that because there are way too many egos now and too many handlers. To actually put that into a package, there would be a lot of work behind that. Here's the fact: If you make a record, you also have to support it. It's about becoming a band again. I think that the band is just so disjointed from each other right now. I think that what brought us together in the beginning was the fresh perspective of doing something different. That would be the only way that I would be able to come back and do this again. Again, not to try and reference TobyMac's career, but he's kind of got his niche. JFH (John): Thanks for talking to us. Kevin Max: Absolutely, it was good seeing you.